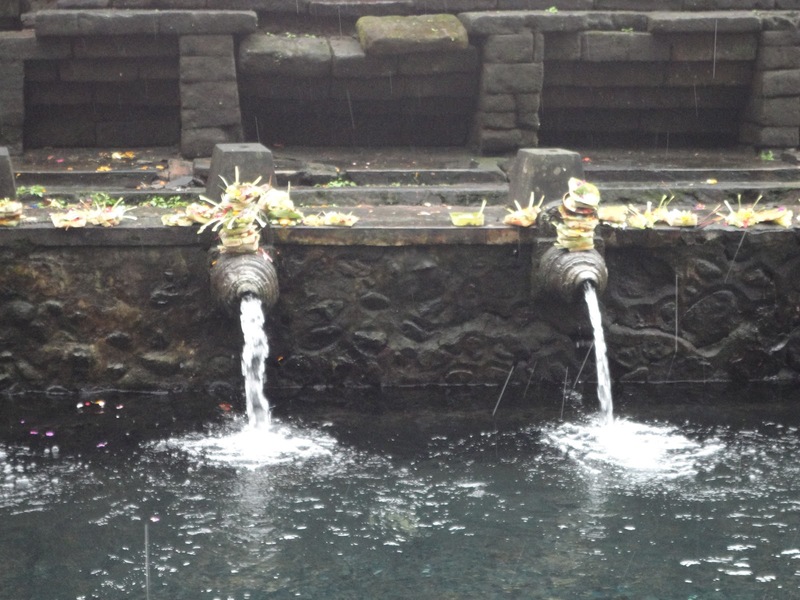 In May 2013, I visited the Healing Waters Temple in Bali. To say it was a memorable experience is an understatement. 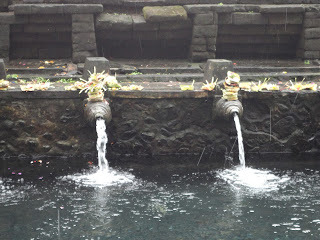 We arrived at the Healing Waters Temple in Bali. Appropriate dress is required. This means sarongs to cover your legs (men and women) and your shoulders should also be covered. Just past the gate we were issued sarongs and orange sashes. We wrapped the sarongs around our waists and tied them with the orange sashes. We made our way to the Healing Waters pool. We put down our belongings and started taking off our sarongs and clothes (we were wearing swim suits underneath in preparation for the healing waters pools). Looking horrified, a little old man ran up to us and gestured for us to stop. There are apparently different rule for being in the pools themselves, not just the temple. He brought us over to a kiosk which took our sarongs and issued us new sarongs (red). He brought us to a changing room and gave us locker keys. 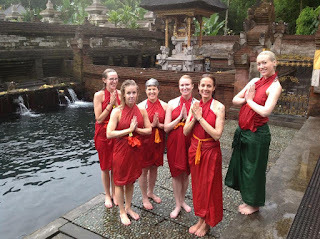 He also showed us the appropriate way to wear our red sarongs (like wrap dresses, different than the first sarongs around our waists). The red sarongs aren't of uniform size. Two of the women in our party had sarongs that were way too short so they were given additional sarongs to tie around their waists. The kiosk ran out of red sarongs at this point and started giving out green ones. Finally, we head back to the pool and start getting in. Another man looks horrified and gestures for us to stop. He pantomimes what we were supposed to do. First, we go into a different pool, drink from the fountain 3 times, then dunk under the fountain. Then we get out of that pool and into another one. We do 2 more fountains. Then 6 more fountains. I think it was 9 in all? There are huge koi swimming in all of the pools. Plus smaller fish, too. The water is freezing. The first dunking under the fountain is BRISK. By the time I'm done with all the fountains, I do feel invigorated, but nothing special beyond that. It is kind of uncomfortable to be wearing a wet sarong. I'm glad I did it. I'm also glad we didn't inadvertently cause any international incidents.